Robert, Mack and Richard Chase (from left holding shovels) along with Mack Energy employees observe a ground-breaking ceremony this morning for the company’s new corporate building in Riverside. The building will be approximately 55,000 square feet and house Mack Energy’s accounting, production, land and geology departments, among others. 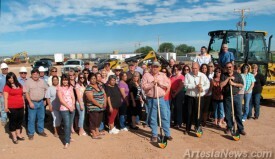 The bid for the project was granted to Jaynes Corporation of Albuquerque. Construction is scheduled to be complete by late summer 2011.